Josco Jewellers is celebrating 'Foundation Day 2014' from 1st December to 6 December 2014. 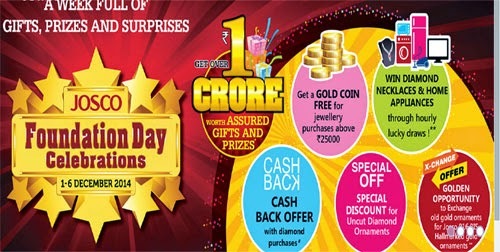 The celebrations include a week full of gifts, prizes and surprises including 1 crore worth prizes, free gold coin for jewellery purchase above Rs. 25000, Necklaces and Home appliances through lucky draws, cash back offer, special discounts, exchange offers etc.